For the last time in their careers, 29 Purdue Boilermaker players will take the field in West Lafayette on Saturday for senior day against the Wisconsin Badgers (6-4, 4-3 Big Ten West). The two teams are tied for second place in the Big Ten West, after No. 22 Northwestern clinched the division title last weekend. 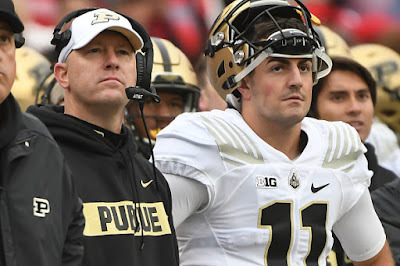 During what has been an extremely roller coaster-like season, Purdue (5-5, 4-3 Big Ten) has shocked the nation with major wins over then-No.23 Boston College, 30-13, then-No. 2 Ohio State, 49-20 and No. 19 Iowa, 38-36. The Boilermakers have also suffered unexpected losses to Eastern Michigan, 20-19 and most recently, on the wrong side of a 41-10 loss to Minnesota. Wisconsin began the season ranked No. 4 in the AP Poll with hopes of reaching the College Football Playoff. After starting the season 4-1, the Badgers went 2-3 in their last five games – with the wins coming against Big Ten bottom dwellers Rutgers (1-9, 0-7 Big Ten) and Illinois (4-6, 2-5 Big Ten). Nonetheless, Wisconsin is bowl eligible for the seventeenth consecutive season, which is tied for the sixth longest active streak in the Football Bowl Subdivision. The Wisconsin Badgers offense is powered by Heisman Trophy hopeful Jonathan Taylor. The sophomore running back has accrued 1548 yards on 228 carries– 6.8 yards per carry. As a freshman, Taylor finished with 1977 yards of rushing and finished in sixth place of Heisman Trophy voting. Taylor has eclipsed 100 yards of rushing in all but one game this season and has reached the 200-yard plateau in three games. With the firing of Bobby Petrino at the University of Louisville, Purdue coach Jeff Brohm’s name has emerged as the early favorite to become the successor. Brohm was born and raised in Louisville, Kentucky and eventually played quarterback for the Cardinals from 1989-1993. Brohm also was on the Louisville coaching staff from 2003-2008, working under several different titles, including offensive coordinator in his final season. While Brohm leaving Purdue for Louisville would make sense, he has denied the rumors to this point. Despite denying the rumors, Brohm’s answers to questions can be left open to interpretation. The Boilermaker offense has been lead this year by quarterback David Blough, who will most likely eclipse 3,000 passing yards on the season against Wisconsin on Saturday. Blough comes in with 2,825 passing yards and 18 touchdowns on the season. Rondale Moore leads all Purdue receivers with 909 receiving yards and eight touchdowns on 82 receptions this season. In the storied history between Wisconsin and Purdue, the Badgers hold the all-time series lead 48-29-8. In West Lafayette, the series is much closer, but Wisconsin still holds a 21-17-3 advantage over Purdue. The Badgers have won each of the past twelve contests against the Boilermakers, a streak that dates back at 2004. Saturday’s game between Purdue and Wisconsin will take place at 3:30 p.m. on Saturday afternoon and can be viewed on the Big Ten Network.